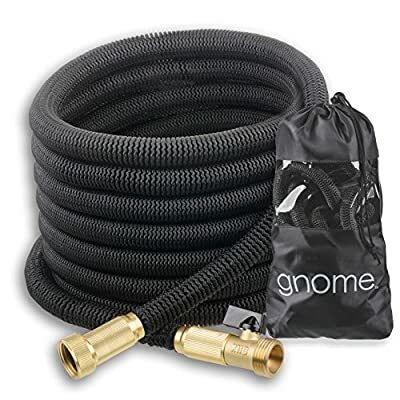 The best Gnome Hose yet, the new design for 2017 is heavy duty, but light weight, flexible, no-kink, compact and perfect for the home, yard, garden, garage, shop, or pets. It features solid brass connectors with a built-in ON/OFF valve. The rugged nylon exterior is 48-ply, 21mm diameter, and resistant to the elements and temperature extremes, but is soft to the touch. This 2017 model has solved the issues other hoses have of chemical reactions between the bungee-type inner tube and the brass connectors. It has a triple-layer core made from heavy duty latex that expands 3x its length when water pressure is turned on and immediately contracts when water pressure is turned off. It will never kink, twist or tangle and is 3x lighter than traditional rubber garden hoses. Quality control and support is from the USA and the hose is manufactured in China so our pricing can be as competitive as possible. Our factory uses advanced manufacturing methods, stringent test procedures, and meticulous quality control for 100% customer satisfaction. Spray nozzle shown in pictures not included. To use: Ensure the rubber washer is firmly inside the female coupling. Turn the hose's valve to OFF, then connect to your water source. Gradually turn on the water source and watch the hose expand up to 3x its original length! When fully expanded, turn the hose's valve ON and use the hose like any ordinary garden hose. Use a spray nozzle to keep the hose properly pressurized and expanded during use. After use, drain the hose and it will retract to its original compact length. Always protect it from sharp objects, and for long-term storage it's best to drain completely and store out of the elements. KINK & TANGLE FREE - Bungee-type core will not kink, twist, or tangle and is 3x lighter than traditional rubber garden hoses. Use with a spray nozzle. Ideal for home, yard, garden, auto, shop, pets, and RV. SOLID BRASS - Heavy duty solid brass connectors with built-in ON/OFF valve. Turn on the water and the hose immediately expands from 17 feet to 50 feet. TRIPLE-LAYER CORE - New 3-layer stretchy latex core is the strongest of any expanding hose, period. Shrinking and self-draining when not in use. Coil and store in a very small space. 48-PLY EXTERIOR - New 48-ply exterior is the most durable webbing created to date. The Gnome hose is easily coiled, lightweight, and soft to the touch. NO RISK GUARANTEE - Questions or issues? Just contact Gnome USA for the fastest US-based support available.